I love this jam. It is sweet, hot and tart. I use it with lots of things, with tofutti cream cheese on toast for breakfast, as a relish in a sandwich, or just spread on the bottom of a pastry tart before adding the filling. I did this recently with some quiches I made using this recipe, and the surprise bite of the chilli and sweetness is good. This is my sister’s recipe and it is easy to make and remember. The ingredients are all in threes and it makes three cups. Throw everything into a saucepan, bring to the boil and reduce the heat to a low-medium and cook until thickened. Pour into clean hot jars and put the lids on tightly. They will vacuum seal as the jam cools. This recipe makes 3 cups. It is easily halved, divided into thirds or doubled with no complicated arithmetic needed! 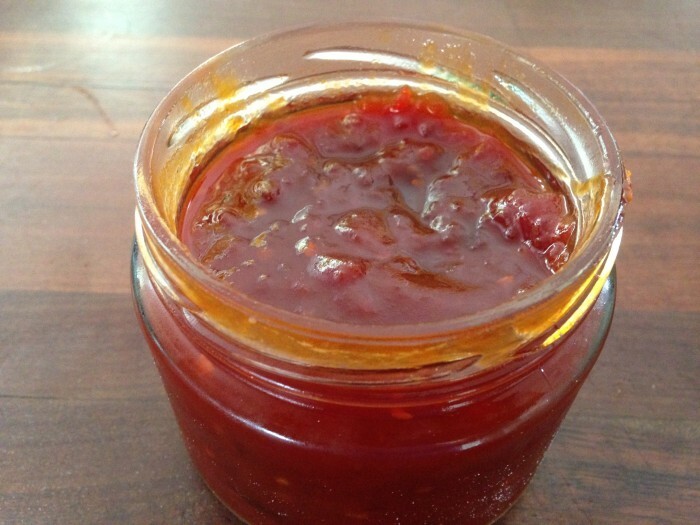 Minced chilli in a jar works fine, but feel free to chop your own!